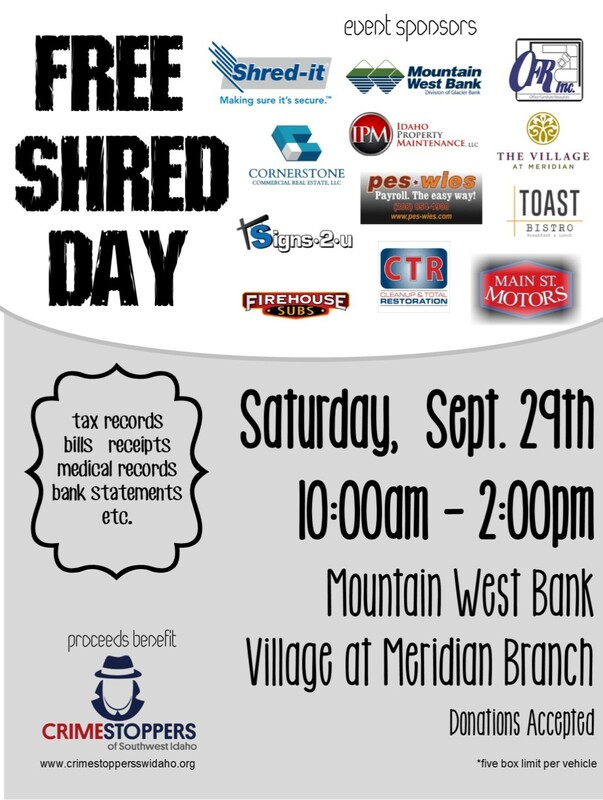 BBB and Crime Stoppers of Southwest Idaho have teamed up to bring FREE SHRED DAY to the Treasure Valley! Saturday April 27 from 10am to 2pm at Blue Cross of Idaho, 3000 E Pine Ave, Meridian, ID. Bring up to five boxes or bags of old documents to be destroyed on-site by Shred-It. Meridian Anti-Drug Coalition will also be on-site with their prescription drug take back. Join us Saturday, September 29 from 10am to 2pm at the Mountain West Bank located at 1660 N Eagle Rd in Meridian for a Community Shred Day. Bring up to 5 box/bags of items to be shredded on site. Help prevent your identity from being stolen while helping keep your community safe. Donations accepted to support Crime Stoppers of Southwest Idaho.